Moises Urena was strolling through the quad at the University at Albany like he owned the place, sweatpants hitched up showing off his high-top Nikes, blue backpack hanging low. “Mentor” was splayed across his favorite t-shirt. At the center of campus, bleached skeletal buildings in mod 60s style surrounded a shallow turquoise wading pool. Moises was surrounded by fellow incoming college freshmen from the Bronx, Brooklyn and Harlem on a bright July afternoon at a special orientation for low-income students. A few were from industrial towns upstate and the working-class villages of Long Island. Most made it out of neighborhoods like the one Moises, who comes from in the South Bronx, grew up in. They resisted being sucked into gangs, drugs and violence by imagining themselves here. Moises said after just two weeks, it already felt like home, but he hadn’t met the kids who came later, who have their own cars and have never done laundry in their life. And even among this group of low-income strivers, Moises realized he was different. The campus felt like home because, for several years, he didn’t have a home. Having a bed that no one resented him sleeping in was not something he took for granted. There were a few others like him. He could tell them apart because they slept with balled up sweatshirts instead of pillows; they didn’t know to bring one and couldn’t afford to buy one. They stayed at the library working until closing time because they didn’t have laptops. They didn’t go out on the weekend. Cab fare and the price of dinner out wasn’t in their budget. Moises has his own laptop, bought for him by the nonprofit that helped him apply to college, but he was also at the library till they kicked him out most nights. He’s determined to graduate, and he knows how hard it’s going to be. He’s watched his mother, Lina Beltre, fight to get a bachelor’s degree for years. She worries that he’ll end up like her. She’s in debt, fighting homelessness, and always wondering what it will take to get those last few credits that she’s sure will launch her out of poverty, into a decent job and, eventually, once she pays off those student loans, into the middle class. Moises’s college loans add up to $7,000 annually, nearly half his mother’s yearly income of less than $16,000. Lina is on her fourth college, this time aiming for a bachelor’s degree. She might finally graduate this year, but she’ll owe thousands of dollars, too. A few months ago, young people rallied around Bernie Sanders in large part because of his proposal to provide free tuition at public colleges and universities. Gov. Andrew Cuomo has taken up the cause, vowing to make college tuition-free at state schools in New York for students whose families earn less than $125,000. If approved by the Legislature, his Excelsior Scholarship plan would cost an estimated $163 million annually by 2019, when it fully phases in, and go further than any other state plan in making college more affordable. But some higher education experts say the proposal misses the point. They argue his plan will mostly help middle-income students who are already likely to attend and then graduate from college, not those least likely to go and most in danger of dropping out once they get there. By their reckoning, the plan won’t help New York boost its 65 percent college graduation rate. Students like Moises and Lina, for example, wouldn’t be eligible under the Cuomo proposal. The plan would only cover tuition for students who are attending school full-time, and would only kick in after other grants were exhausted. Moises’s tuition is already covered by federal and state aid. His loans are for room and board, which at the University at Albany, a part of the State University of New York (SUNY) system, are twice as much as tuition, at nearly $13,000 a year. Lina has exhausted her federal and state aid, but she no longer attends school full time, a requirement of the Cuomo plan. “We can’t leave behind families who need more assistance to close that financial gap,” said Ian Rosenblum, the executive director of Education Trust–New York, a nonprofit education advocacy group that published a report about the Excelsior Scholarship. The national college graduation rate, after six years, is about 60 percent. For financially strapped students who receive Pell grants — more than a third of college students at four-year schools — it’s closer to 50 percent. That’s a lot of people on track to fail. Cuomo’s plan requires students to go full time because they’re more likely to graduate. New York’s state financial aid program for low-income students is already one of the most generous in the nation, officials say. Students with income as high as $80,000 are eligible for tuition grants under an existing state program. A spokesperson for Cuomo, Frank Sobrino, said the state currently spends $1 billion on grants for low-income students. “The Excelsior Scholarship program will ensure that low-income students are maximizing every dollar available to them and bring more students into the fold with free tuition across the board for any family making less than $125,000 per year,” he said in a statement. Lina was rinsing mint leaves in her sink on a sweltering July day, a few days before Moises headed to the University at Albany for orientation, perfuming the air in her dimly lit first-floor apartment a few blocks from Yankee Stadium. She declines to give her age, but she’s often mistaken for a 20-something. 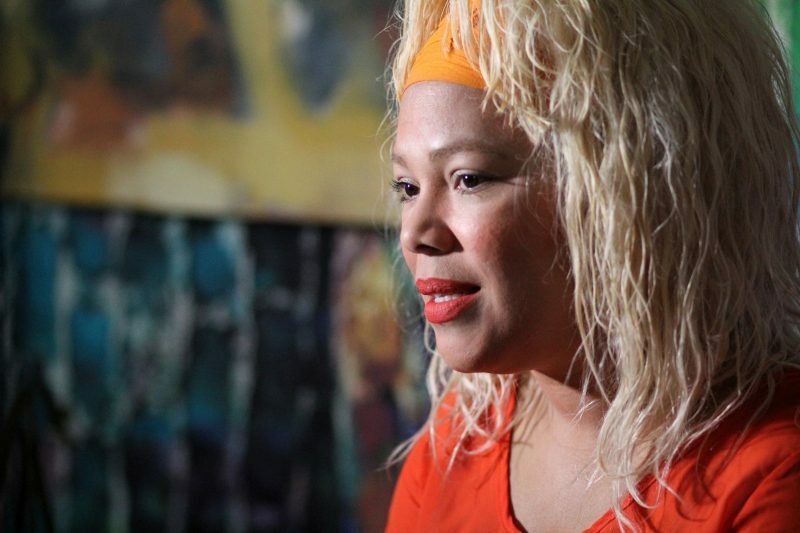 Her gentle voice has a light accent that recalls her Dominican roots. The apartment is decorated with flowing curtains, paintings done by friends and an eclectic mix of furniture she’s collected gradually; each year she allows herself to buy one piece using money from her income tax return. That weekend, she was hosting a Saturday night “salon” for artist and musician friends —the mint leaves were for mojitos. Admission would be $20, and if she earned a profit, it would go toward rent and a care package for Moises to take to college. Lina has a place to call home now, but she is always one unexpected bill away from a return to homelessness. She believes a college degree will save her from that fate. But college bills are also partly to blame for the gradual unraveling of her life. Lina earned an associate’s degree from LaGuardia Community College in Queens in her twenties, working on the side to pay for her tuition and staying late at the library because she couldn’t afford textbooks. She met Moises’s dad there. When she graduated, she worked as a preschool teacher for 15 years, a low-paid job, but a good one. Lina quit her preschool job to move to Pennsylvania with Moises’s father and her young son, but the relationship broke up. 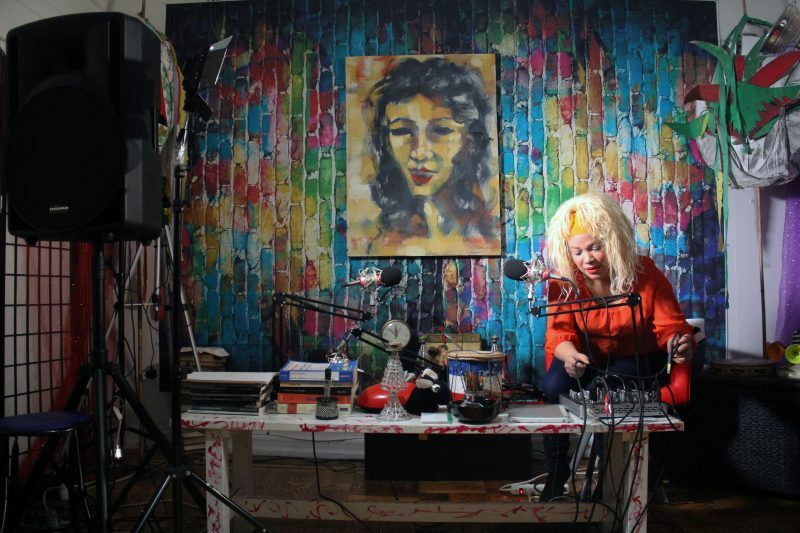 She moved back to New York, hoping to pursue a dream of being an actress and artist. She bounced from relatives’ homes to apartments where she was always wearing out her welcome or fighting eviction. She had another baby, found work at a daycare center and meanwhile tried to finish her bachelor’s degree by taking online courses through the University of Phoenix, a for-profit school with dismal graduation rates. Stressed about housing, working full time and sleepless from nights awake with a baby, she found it hard to do the work online. Eventually she gave up. She thought she might do better at a brick-and-mortar school, so she signed up for a medical technician program at another for-profit, Sanford-Brown College. She earned her certificate, but a classmate accidentally stuck her with a needle during training and she lost her stomach for the job. “I should have a master’s by now,” she said. Instead, her college aid was tapped out and she owed money for loans. 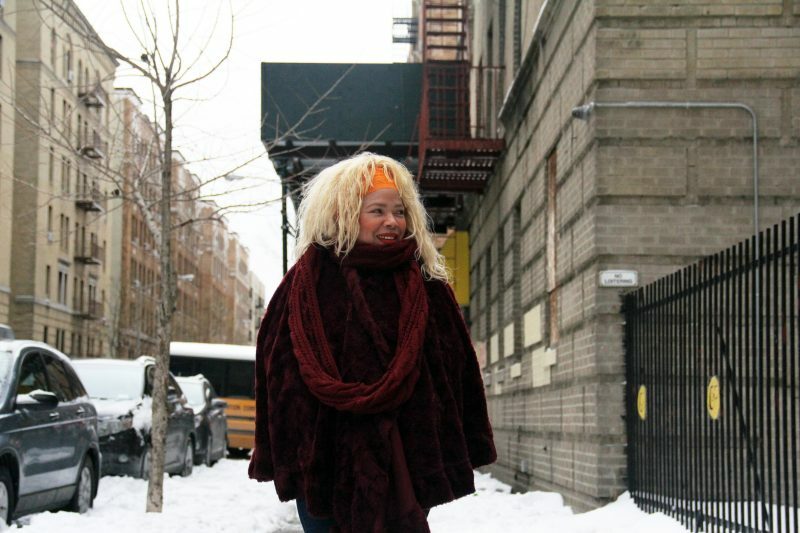 She became homeless when Moises was in middle school, after relatives lost patience with hosting her and her children. Moises began skipping school. Lina’s youngest was anxious. Lina took on housekeeping and waitressing jobs while trying to find them a permanent place to live. Lina remained convinced a bachelor’s degree was the family’s way out. As soon as she secured a one-bedroom apartment in the Bronx — with the help of a city subsidy — she signed up for classes at Metropolitan College of New York, a nonprofit geared to adult learners like herself. It has a 31 percent graduation rate. A City University of New York college would have been cheaper, but she worried she’d fail the required math placement test and she didn’t want to waste time. Metropolitan is devoted to serving students like Lina, one of the “nontraditional students” who make up an astounding three-quarters of the American college population. More than a quarter of college students in 2012 had dependents, and 15 percent were single with dependents, according to federal numbers. A quarter of college students work full time. Rosenblum said the Education Trust’s report found that in communities where the average income is less than $50,000, the average student loan debt is more than $25,000 per borrower. Rosenblum thinks Cuomo’s plan should include part-time students, and argues the value of the state’s existing Tuition Assistance Program (TAP) grants should be increased and programs for needy students should get more funding. Others have argued that the new scholarship should also include room and board. Lina’s Pell and TAP aid was gone by fall semester 2016, used up on earlier attempts to earn her degree. She’d hoped this year would be her last, but starting with the salon night she planned over the summer, things began to fall apart again. The party never happened. Her daughter woke up complaining of a sharp pain in her side. Lina rushed her to the hospital where they diagnosed the child with an intestinal infection. The rest of the week was spent at the hospital. Moises headed to Albany for his summer orientation alone. Lina’s daughter recovered, but was pulling out chunks of her own hair when her anxiety worsened in the fall. Though Lina was determined to keep up a full load of classes in order to finish faster, she was also dealing with medical problems of her own, and had no idea how she’d pay off her loans for tuition at Metropolitan, which, at about $18,000 a year, is much higher than New York’s public institutions. Her professors liked her. “She asks questions all the time. That’s a person that always wants to learn. That’s the type of person that professors want to teach,” said Michael Altamirano, a business professor who taught Lina in a marketing class. But by mid-fall, she was failing a course and worried it could derail her plans to finish by June. The pep talks she gave Moises had become warnings. At Thanksgiving she lectured him lightly: “It’s your first semester. Concentrate on your studies. I just don’t want you to get stressed out and end up dropping out,” she told him. Moises was playing basketball by himself at a park near Yankee Stadium on a spring afternoon last year. Several boys from the neighborhood surrounded him and slammed him to the ground. He fought back, and they ran off. But he was badly shaken. His teachers at the American Sign Language and English Secondary School sent him to the hospital next day, and doctors said he’d had a concussion. The American Sign Language school serves fewer than 200 kids and the high-needs population at the school struggles. Only 55 percent graduated on time in 2015, although 83 percent made it to a diploma after six years. It wasn’t Moises’s first choice in the New York City school lottery, but he liked the personalized environment so he stayed. He quickly picked up sign language, but when he started high school, he couldn’t imagine himself going to college. Cuomo’s plan to make college free is meant to help more students envision themselves on a campus. But a weekend trip to Amherst College in Massachusetts the summer before his senior year is what did it for Moises. College Summit, a national nonprofit, tries to harness the “power of peer pressure” for good, training influential students to persuade their friends to apply for college. The Amherst weekend was the entry point for recruits: four days away at a college, sleeping in dorms, learning about financial aid and application paperwork, and writing a personal essay. The idea was for students to go back home and essentially become guidance counselors for themselves and for their friends. Despite his academic stumbles, Moises was an ideal College Summit student. He was popular, with a big crinkly smile, an earnest personality and natural charisma that drew in both his peers and teachers. Moises had signed up for the weekend because it would be a break from family stress. He came back evangelizing for college. “My whole life changed after that,” he said. He made College Summit the school’s coolest club. He worked to bring up his GPA and began leaving an hour early in the morning so he could stop to pick up a friend who was always late. He became student government president and started a mentoring club, taking several underclassmen under his wing. After he was attacked in the park, Moises checked his email obsessively for a response from his dream school, University at Albany. When it came, he was ecstatic. He’d been accepted through the Educational Opportunity Program (EOP), a 50-year-old state program for low-income students that lowers test score admission requirements and provides a host of supports, including money for textbooks and fees and an intense summer boot camp for incoming freshmen. When he boarded a bus to Albany with a gift bag of bedding, toiletries and slippers from his high school and the laptop he won from College Summit, his teachers knew he’d do well. But by mid-summer, some of the sheen was gone. Moises was struggling in one of his summer orientation classes. The EOP summer program enforced strict rules; kids could only use their cell phones in their rooms, had to follow a dress code, and couldn’t interact with non-EOP summer students. Moises had few chances to check in to see how his mom and sister were faring, and worried constantly about them and whether he could hack it when “real” college started in the fall. That’s why it works, said Maritza Martinez, the director of University at Albany’s EOP program. 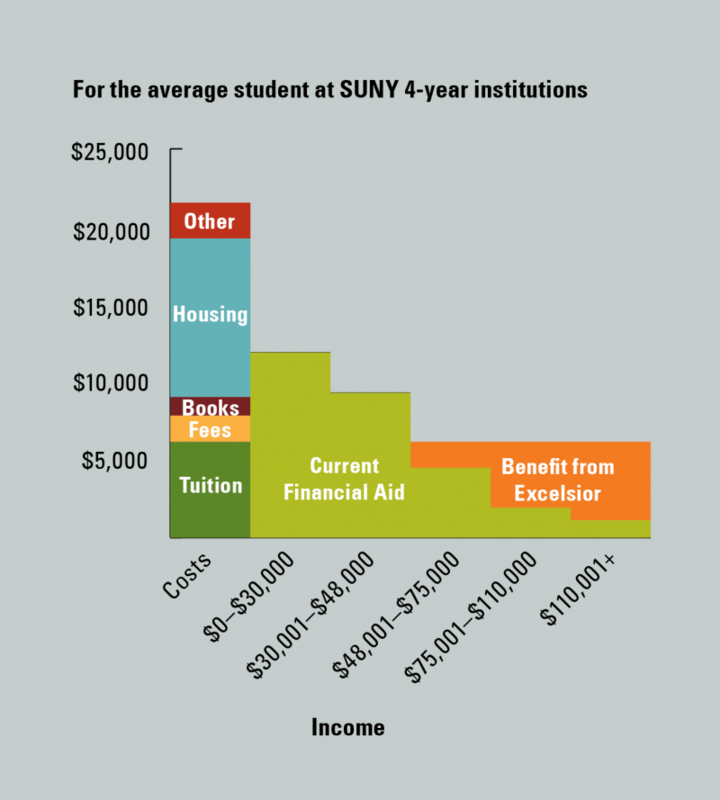 Low-income students tend to graduate at lower rates than their peers, but the rate for EOP students is three points higher than the overall graduation rate at Albany, according to a spokesperson. 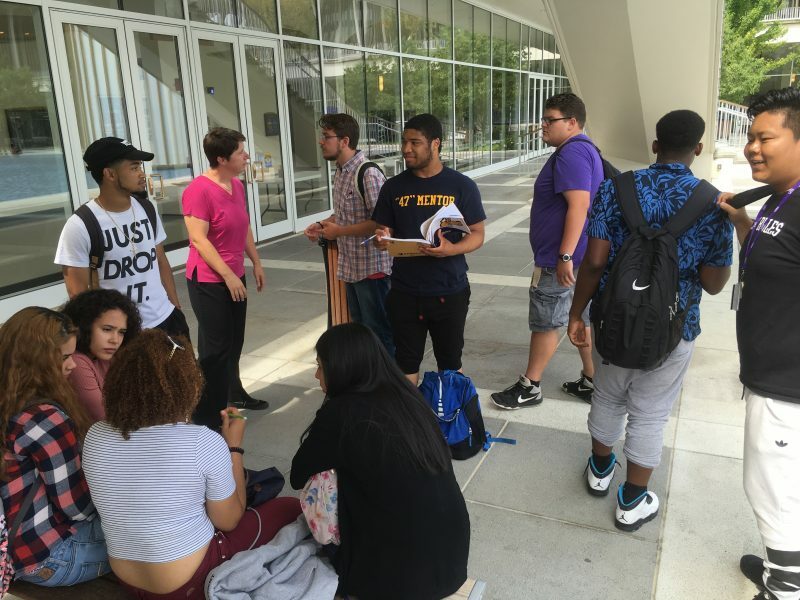 For the entire SUNY system, the six-year graduation rate for students in EOP is 67.7 percent, according to a SUNY spokesperson, compared to 65.7 percent for all students. “We go strong on getting them ready for what awaits them,” Martinez said. Lina misses Moises desperately. During their rockiest times, he was a calming presence. His little sister clung to him. He did the laundry and made her coffee. Without him around, the stress of juggling school, job and caring for her daughter is harder, but Lina has also found a thread of hope. She qualifies for grants and tutoring from Metropolitan’s Welfare to Careers Project. “Four or five years from now, I’m not going to be in the same situation I’m in now,” she said. Moises also misses home. “Sometimes I feel selfish or bad that I could have stayed and helped my mom,” he said. But now he is in a groove. The tiny cohort of Educational Opportunity Program students has become a surrogate family. 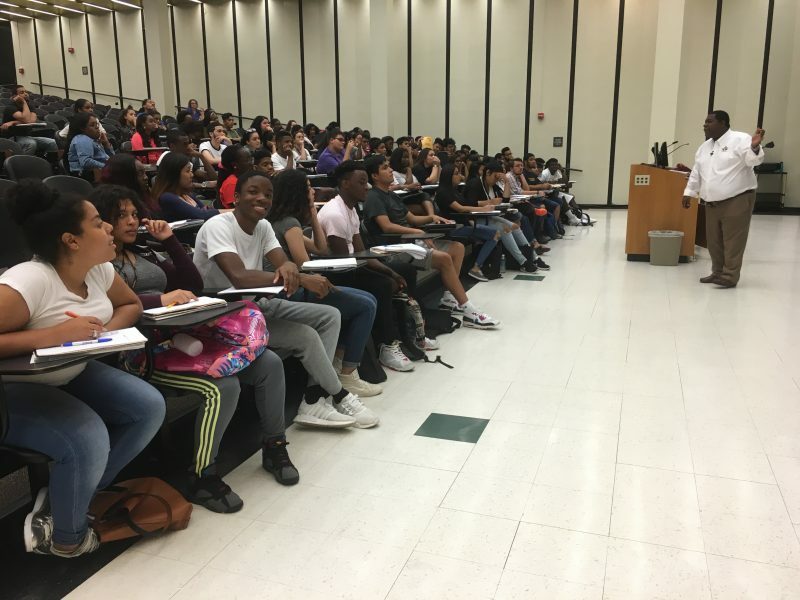 If a class becomes difficult, his EOP training has taught him what to do: Call the professor for help, visit the tutoring center and crack the books. It doesn’t hurt that he can’t afford to go out on the weekends; partying is rarely a distraction. Mid-semester, watching the presidential election out of the corner of his eye and dreaming of his own plan to run, he campaigned to represent his quad in student government. A dorm-mate who could afford to photocopy hundreds of flyers beat him, but he was heartened at the 93 votes he did get. Next year, he has vowed to save up money for the copy machine. The homey feeling when he first arrived on campus has shifted into something more complex. “I don’t see as many people like me as I thought I would,” he said. He often sits in the front of class, in part because he learned students who do so tend to earn better grades, but also because he can’t see the sea of white faces when they’re behind him. “I feel like I belong here, but it also feels like I don’t have who I need up here. I don’t have people who struggled like me,” he said. He finished out the fall semester by making the Dean’s List. This spring, he’s signed up for seven classes, including one preparing him to be a Residential Advisor next fall, which would cover room and board and eliminate any future need for loans. He also works a $10.75-an-hour job at Dunkin Donuts on the 3 a.m. to 9 a.m. shift, four days a week. He uses the money to buy notecards, pens and snacks for the weekend, and recently bought a pair of UGG boots for his mom. Early on a blustery March day, Moises was exhausted and fighting a cold, but optimistic. Dressed in a new gray suit from JCPenney and a muted gold tie, he had turned down an extra Dunkin Donuts shift so he could present his plan to open a nonprofit mentoring group to 1 Million Cups, a group of entrepreneurs who volunteer to help startups. Then he headed to the capitol to join his classmates for a day of lobbying legislators for increased funds for the Educational Opportunity Program. SUNY receives 15,000 qualified applications each year for the 2,900 available seats in the program, a spokesperson said. Money has fluctuated in recent years. Last year, the EOP program received $32 million. This year, Cuomo proposed decreasing that total to $26.8 million. New York State Assembly Speaker Carl Heastie, who was an EOP counselor at Stony Brook University, proposed increasing EOP to $37.5 million this year. The Assembly’s budget also calls for expanding TAP and modifies the Excelsior Scholarship to allow students to apply some of their federal aid to non-tuition expenses like room and board, meaning more students would be able to take advantage of the governor’s free tuition plan. Administration officials said Cuomo’s proposed funding for a host of programs targeting needy college students, including EOP, has increased by 31 percent since 2012, to $177.4 million in this year’s executive budget. Moises doesn’t think college should be free for anyone, although he supports the idea of making college more affordable for more people. He believes students value their education more if they have skin in the game. Six Democratic state legislators who collaborated with Republicans lost their primaries yesterday.